Spicy flavors are favored and appreciated by a lot of people, and spicy dishes are common in Korean, Thai, Mexican, Indian, Middle-Eastern, and other cuisines. This flavor can be obtained by using natural ingredients such as chili pepper or by adding spices such as chili powder. 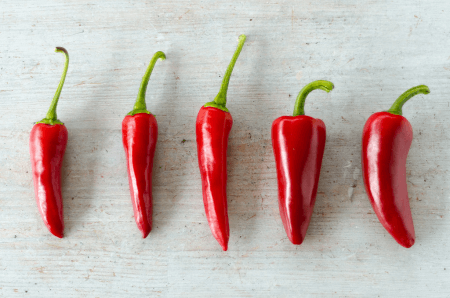 What is the difference between chili pepper and chili powder? Let’s find out in this article. Can be dried or pickled Ground, dried chili peppers with some spices such as oregano, cumin or garlic powder. The chili pepper is a fruit from the plant genus Capsicum. It originated in Mexico, and since at least 7500 BCE has been used both as food and medicine. Christopher Columbus is believed to be the first European to see a chili pepper. He called them “peppers” because, like black peppers, they have the spicy taste. Chili peppers were brought to Asia by Portuguese navigators in the 16th century. In the present, India is the largest producer, exporter, and consumer of chili peppers. Chili peppers contains capsaicinoids. The capsaicinoids bind with receptors in the mouth that send a message to the brain that something hot has been consumed.The heat of chili peppers is historically measured in Scoville heat units (SHU). The world hottest chili pepper is the Carolina Reaper which is grown in the United States and is measured at 2.2M SHU. Chili peppers can be consumed fresh, dried, or pickled. Dried chilies are ground into powders. Fresh chilies are added in Puttanesca sauce, curry dishes, Thai green papaya salad, Kung Pao chicken, and other dishes. Chili peppers are said to be good sources of vitamin B, vitamin C, potassium, and iron. There is also a published study that found that humans who consumed spicy food were less likely to die of diabetes or cancer. Chili powder is made from dried chili pepper that has been ground. Some spices are added when making a chili powder blend. These spices include oregano, garlic powder, and cumin. In some cuisines such as Tex-Mex, India, Chinese, Thai and Korean, cayenne pepper is used to make chili powder. However, other types of chili peppers can still be used to make chili pepper such as jalapenos, anchos, or pasilla chilies. Because of this, the spiciness of the chili powder varies depending on the chili pepper used. The first commercial chili powder became available in the United States in 1894, created by William Gebhardt. Chili powder was invented because chili peppers were only available at certain times of the year, yet they are a popular ingredient in cooking Chili con Carne. Gebhardt imported peppers from Mexico, dried, and ground them to create the first commercial blend of chili powder. 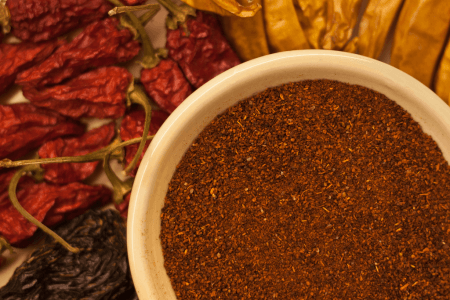 Chili powder is used in cooking Latin American dishes such as tacos and Enchiladas. It can also be used as the base ingredient in grilled meats, soups, and vegetables. Chili powder is said to contain antioxidants and vitamin C. It may also help improve insulin regulation because of its carotenoids. While both chili pepper and chili powder have a spicy taste, they have a lot of differences in origin, the method of consumption, and health benefits. Chili peppers originated in Mexico and were brought to Asia by Portuguese navigators in the 16th century. On the other hand, chili powder was invented in the United States by William Gebhardt in 1894. Chili peppers can be dried or pickled prior to consumption to create a unique flavor. Chili powder is ground dried chili peppers with some spices such as oregano, cumin or garlic powder. Fresh chilies are added in Puttanesca sauce, curry dishes, Thai green papaya salad, Kung Pao chicken, and other dishes. Chili powder is used in cooking tacos and enchiladas. Chili peppers are said to be good sources of vitamin B, vitamin C, potassium, and iron. Chili powder may help improve insulin regulation because of its carotenoids.